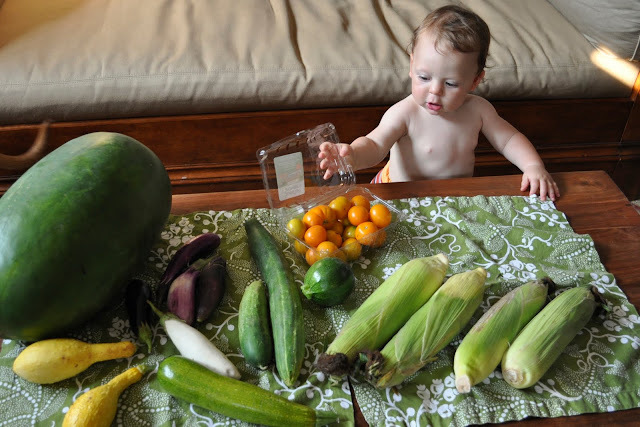 The Summer is winding down--only two weeks left--and our CSA has offered us so much this season: nutrition, weekly excitement anticipating what we'll receive next, and big adventures in the kitchen and around the table. I'm grateful we had the opportunity to belong to our local Crop Share and I hope to do it again next year! My favorite recipes from last week included a basil-lime soda, and a luscious tomato soup. For the soda I made a simple syrup in which I steeped 1.5 cups fresh basil-lime leaves for about 2 hours. I removed the leaves and chilled the syrup then sweetened to taste tall glasses of icy soda water. Refreshing!! The lime-basil flavor was a little odd--similar to root beer but too perfum-y for my taste. However, the technique was so, so easy, that I'm inspired to experiment with other fresh herbs. I also made homemade croutons to garnish the soup. I bought two small rolls of rosemary bread, sliced the bread into cubes, and sauteed them in olive oil until all the oil was soaked up and the edges of the bread began to brown. Then I transferred the croutons to an oven heated to 350 degrees until they were crisp and lightly browned all around. A generous sprinkling of Fleur de Sel and they were so delicious I could barely stand it. That tomato soup was OH SO DELICIOUS!! Especially with the croutons!! OMG!! SOOO GOOD! I'm so glad you liked the soup! That's been my favorite dish this summer, especially with all the wonderful tomatoes Virginia farmers have to offer.